Crew 276 group photo. Image courtesy of Venturing Crew 276. 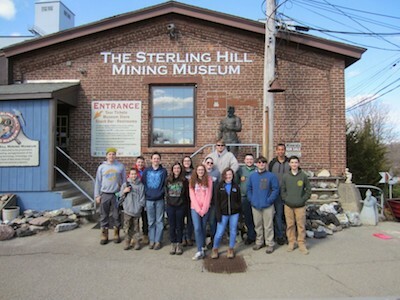 On April 11, 2015 Venturing Crew 276 camped overnight at the Sterling Hill Mine and Museum. 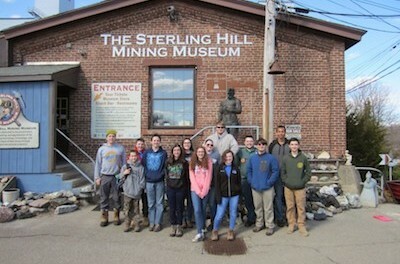 When we got to the mine, we gathered outside the gift shop and waited for Bill Kroth to give us a quick tour of where we were going to be sleeping. Cabins – no. 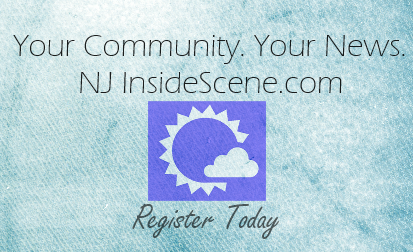 Tents – no. We were allowed to sleep inside the mine! After we setup our sleeping area, we got a great tour. 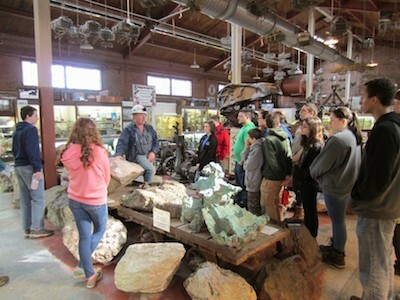 It was jam packed with information about the mine and geology. We also got to explore their museum. We then had dinner and then after dinner we headed into the mine to play some games. Bill Kroth teaches Venturing Crew 276 about mining and the importance of it. Image courtesy of Venturing Crew 276. A little while later one of the mine workers informed us of their “Blackout Tour” that took place during the night and with no lights! We started outside then headed inside the mine and during the tour the only light that was used was a Short-Wave Ultraviolet light which was used to make the fluorescent minerals glow. After the Blackout Tour we got to use the Ellis Astronomical Observatory and we looked at Jupiter and its moons. We then went back into the mine to go to sleep. The next morning we had breakfast and completed the Geology merit badge and the Mining in Society merit badge. This was important to me because the Mining in Society merit badge was my 100th merit badge completed! My favorite part of this trip was the fluorescent rocks that glow in the dark and getting my 100th merit badge. 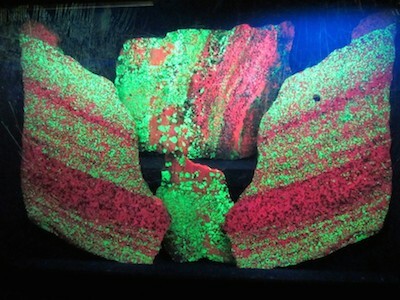 Fluorescent minerals glowing. Image courtesy of Venturing Crew 276.